Come and learn how to build a successful company and network with local business executives. When you attend this event you will learn about "5 Keys required to build a successful business in today's challenging economy! You will leave with great concepts on how become an inspiring leader, utilize great systems and become 100% laser focused and organized! 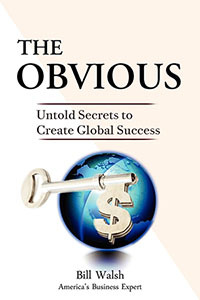 All Attendees will receive a $97.00 valued digital Ultimate Success Secret's including Bill Walsh's new book "The Obvious". The Winning the Game of Business presentation has been developed for anyone that is serious about learning the mindset, systems and accountability programs that are necessary in creating a mega-successful business! You will also be able to network with many successful people from various backgrounds and can also share your business and expertise with our clients. Come and meet some amazing local leaders. Powerteam International is one of the leading Success Education Companies in the world! Powerteam provides Corporate & Entrepreneurial training programs, Venture Funding and Business Coaching in cities around the world. Through Online Success Coaching, live events and full-service business consulting. Powerteam International has the resources necessary to help your company become even more successful! For all major industries, from start-up companies to billion-dollar firms, the professionals at PTI have insight and solutions to create new market opportunities and increased optimization! This includes having a personal success coach or professional coaching team that will offer priceless insight and advice. Topics include: advertising, leadership training, web site development, website traffic generation, business financing, international expansion and personal development. We offer some of the best high-level consulting and training for business leaders and their organizations. Our clients range from start-ups to mega-successful corporations.